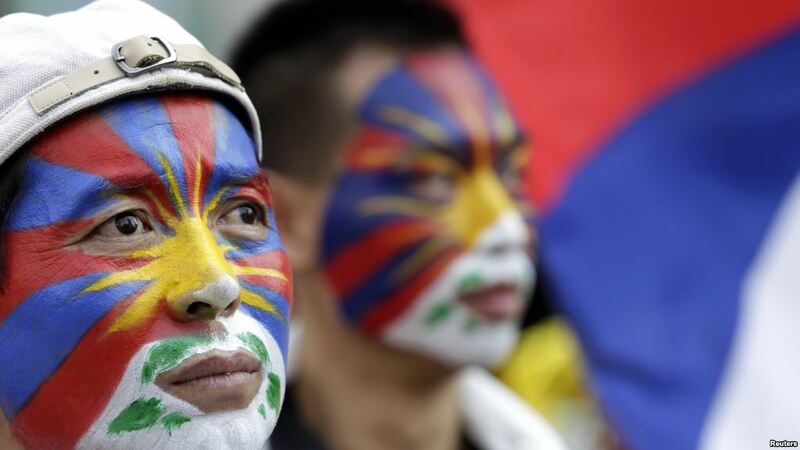 (TibetanReview.net, Mar10, 2015) – Tibetan and Tibetan advocacy groups as well as Taiwanese human rights organizations on Mar 8 organized a demonstration involving hundreds of supporters in Taipei ahead of the 56th anniversary of the Tibetan national Uprising of Mar 10, 1959. The procession drew a diverse crowd of different nationalities, as monks draped in maroon-and-yellow robes walked alongside Taiwanese supporters dressed in traditional Tibetan garments, reported taipeitimes.com Mar 9. Pro-democracy activists from both sides of the Taiwan Strait must stand in solidarity with Tibetans in their human rights campaign, Taiwan Association for Human Rights Secretary-General Chiu E-ling was quoted as saying. In their speeches, the organizers also accused President Ma Ying-jeou’s administration of ignoring China’s treatment of Tibetans and urged it to take a stand on the issue. “While Taiwan and China establish ever-closer economic ties, Taiwan’s government has failed to stop the Chinese government from massacring Tibetans,” Green Party co-chair Lee Ken-cheng was quoted as saying. The rally from Taipei’s Zhongxiao-Fuxing MRT station to Sun Yat-sen Memorial Hall ended with the participants lying down on pavement in memory of Tibetans who had carried out self-immolation protests against Chinese rule.